MUMBAI (Reuters) - The rupee weakened to 50 against the dollar on Friday, a level not seen in more than 28 months, as investors globally continued to dump high yielding riskier assest for the safety of government bonds. 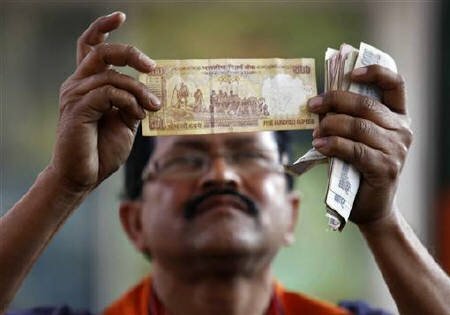 At 9:28 a.m. (0358 GMT), the partially convertible rupee was at 49.82/83 per dollar, after hitting 50 in a one-off deal, its weakest since May 14, 2009. It had closed at 49.57/58 on Thursday.